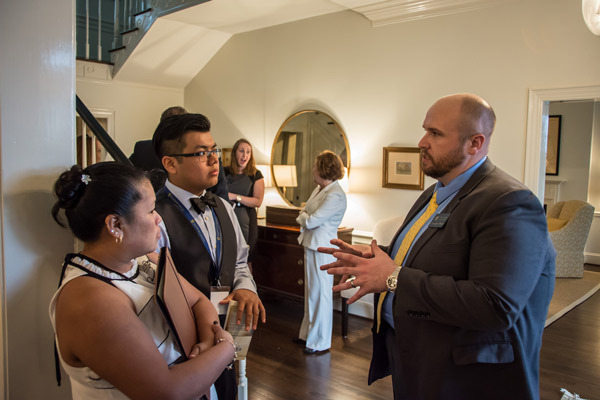 Sharp Scholar Jesus Guzman Bonilla and his mother, Letiticia, speak to Assistant Director of Admissions Christopher Bryan. 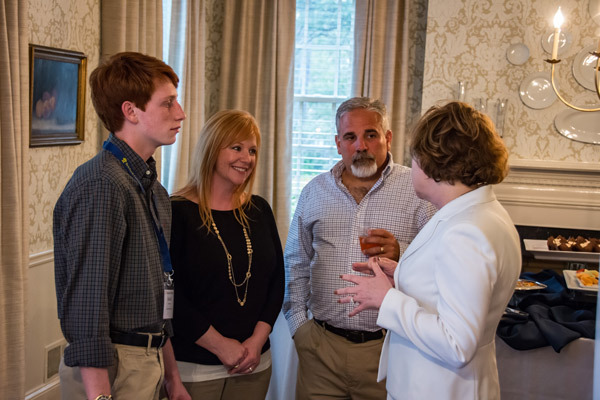 Sharp Scholar Kendall Byrd and his parents speak with Reinhardt University Dr. Kina Mallard at her home during a reception following the ceremony March 30. Some of the best and brightest to enter campus this fall were honored in a scholarship ceremony March 30. Reinhardt University President Dr. Kina Mallard and Dr. Mark Roberts, vice president and dean for academic affairs, awarded 22 high school students Sharp Scholarships in the Bannister Glasshouse surrounded by family and friends. Sixty-five high school students went through the application and interview process, with only one-third receiving a scholarship between $2,000 and $5,000. Current Sharp Scholar Madeline Gray addressed the students and their families in attendance, telling her story as a Sharp Scholar and her experience at Reinhardt. Jamonte Jackson, from Jefferson County High School near Augusta, said Reinhardt feels like home to him, and he is excited to receive the scholarship, as well as have the opportunity to play football. Jackson plans to major in sports administration. Brooke Fountain, from North Paulding High School, was named a Sharp Scholar and said that the close-knit family and small campus was welcoming to her. Her father, Matt, said he is proud of how hard she has worked to earn the scholarship. “The commitment she has made, she’s really gone above and beyond what I ever did and one of the things really made me proud for her was going from getting the HOPE Scholarship and just being willing to come interview for the Sharp Scholarship,” he said. Jesus Guzman Bonilla, from Centennial High School in Roswell, said he is thrilled that his hard work has paid off. Sharp Scholar Sarah Burgess said she is excited to join the Reinhardt family. To be eligible for the Sharp Scholarship, which is named for the university’s co-founder, J.A. Sharp, students must meet high academic standards and participate in a two-day fellowship and interview process with deans and university staff and faculty. Brady Watkins, of Woodstock, majoring in Business.